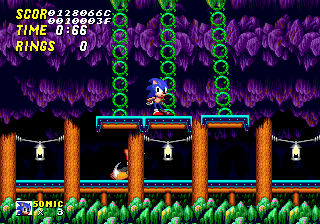 In the level select of Sonic 2 Beta, 'Dust Hill Zone' actually links back to Mystic Cave Zone. Most likely the pointers for the original Dust Hill Zone were changed to point to the new Mystic Cave level, and the name wasn't changed at the time. Here a selection of 3 swinging objects are moving in motion, but in the final, only two swing and hit each other. They also only appear in Act 2, while this appears in Act 1. 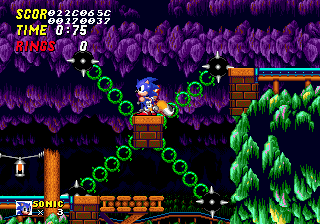 Here a set of four spiked balls surround this platform and circle around it. Similar items are found in the final, but none with four like this one. 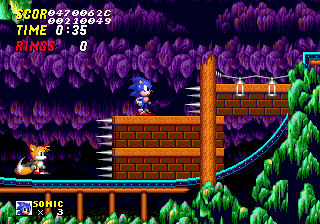 These spiked, moving platforms are different to the final game. In the final their backs would be covered over, but here they sit out in the open. 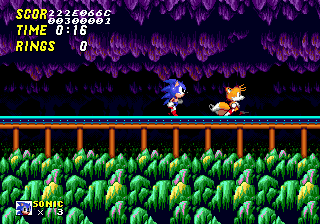 in Act 2 the Eggman battle doesn't occur, just leaving Sonic and Tails stuck in an empty area. The roof is also missing, where Eggman comes out of in the final.